No Mini Power Brush for cleaning stairs. A Comprehensive Review of the Shark ION P50 Lightweight Cordless Upright Vacuum (IC162)! of the Shark ION P50 Lightweight Cordless Upright Vacuum (IC162). The Shark ION P50 Lightweight Cordless Upright Vacuum (IC162) was designed to offer the advantages of a full-size corded upright vacuum with the convenience of battery-powered operation. care products that customers love has accelerated its growth to include offices and manufacturing facilities in US, Canada, UK, and China. You can purchase SharkNinja products from major retailers around the globe. SharkNinja products reflect the company’s mission statement “breakthrough thinking” and the “next big thing” with customer satisfaction always first. Sometimes I wonder if SharkNinja gives their design team enough time off. It seems like every time I turn around they are introducing another vacuum with really WOW features. Not to be confused with gadgets and gimmicks to get your attention, but meaningful and helpful features. This distinctive-looking NEW Shark ION P50 Lightweight Cordless Upright Vacuum (IC162) may actually be the most practical Cordless Vacuum currently available. Unlike other upright battery-powered stick vacuums the ION P50 has SharkNinja’s proven DuoClean Technology that amounts to One Powerhead and Two Brush Rolls that facilitate impressive cleaning performance on both carpet and wood and other hard floor surfaces. This clever idea solves the problem of cleaning up large debris such as dry cereal or pet food from carpeting and your hardwood floors. You’ve probably experienced the frustrating problem of how ordinary vacuums tend to plow the large debris along the floor instead of sucking it up. 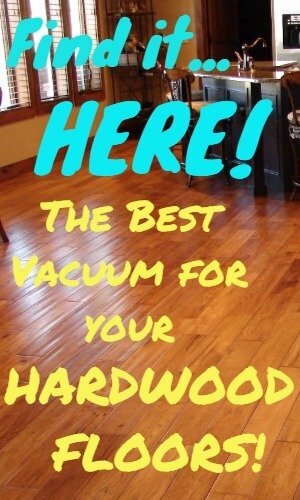 Or, when you rock your vacuum back just a little to give it clearance room it flings some of it out the back. Watch the SharkNinja DuoClean Demonstration VIDEO! 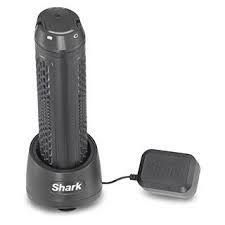 Away” feature into the Shark ION P50 Lightweight Cordless (IC162). This expands the versatility of the vacuum by enabling you to launch the Pod and use it as a handy portable for managing over-head cleaning and all around the house. I have discovered this is one of the best ways to clean those carpeted stairs or upholstery. It frees you from having to drag the main unit around so you can get to the really difficult to access places. If you happen to share your home with pets that shed hair you will appreciate the up-sized Dirt Cup. Dirt capacity has continued to be one of the common complaints with cordless stick-type vacuums. The ION P50 lets you finish cleaning a sizable area without the bother of having to stop and empty every few minutes. At full capacity the ION P50 (IC162) holds 0.54 dry quarts which is slightly less than the popular Dyson V8 Absolute at .6 dry quarts. And when it is time to dump the dirt the ION P50’s dirt cup is one of the easiest to empty I have seen. Another issue that has been a put-off to cordless vacuum customers is that most of them have “built-in” batteries. The problem with that is that once the battery begins to not hold a full charge (normally after 2 years minimum) your faced with the reality that the appliance you paid several hundred $$$’s for is now basically a useless piece of junk. Runtime is another nagging issue when it comes to battery-powered vacs – about the time you really get into your house cleaning you have to stop to recharge. SharkNinja has addressed that issue by equipping the ION P50 (IC162) with a 28.8 Volt Lithium-ion Battery Pack. 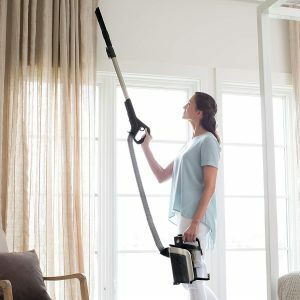 This gives you up to 30 minutes of runtime in the Upright or Lift-Away mode to do your cleaning. Or up to 50 minutes in Above-Floor mode. That should be enough time to clean up to a 1500 sq. feet area. When you receive your new ION P50 the battery is about 1/3 charged. SharkNinja recommends you charge it overnight to fully charge it for the first time. After that you can expect about 3.5 hours to recharge. The ION P50 comes with a charging cradle and charger which gives you two options for charging: (1) Charge the battery while it’s installed in the unit. Or (2) Remove the battery to charge. If 50 minutes isn’t enough time to get your cleaning accomplished you can DOUBLE THE RUNTIME by simply ordering a second OPTIONAL battery pack. SharkNinja will be making the Replacement Battery Packs available on Amazon as soon as they catch up on their initial production. As for now you can order one by calling Shark® Customer Care at 877-581-7375. The large 28.8V battery gives the Shark ION P50 (IC162) plenty of suction power to deep clean low to medium pile carpet. The rear brush roll with stiff bristles gives aggressive agitation for digging out deep down dirt. The Soft roller lets you easily clean up any large debris from the surface without pushing it around. Removing pet hair presents no problem! Cleaning performance on Long pile or Plush Soft Carpet was less impressive using the normal suction mode, although it will clean surface dirt and debris easily. When you activate the Power Surge mode by holding down the button it will get the job done but it reduces the Runtime. If your 300 sq.ft. family room has long pile or Plush carpet you might not make it through the whole job. Because of the DuoClean cleaning head with two rotating power brushes the ION P50 gets plenty of traction on carpet making it easy to push but it gives some resistance when pulling it back. Considering the improved cleaning performance I consider it a mild inconvenience and equitable trade-off. This however could be a deal breaker for an elderly or physically challenged person. You will achieve the best results by activating the Hard Floor Mode by pressing the button on the handle. This slows down the rotation of the spinning brushes. While vacuuming, both the Soft and Stiff Bristle rollers are active. I have read a couple Customer Reviews that expressed concern the stiff bristles might scratch their wood floors. Currently, SharkNinja offers about 8 different Models with the DuoClean feature and I have NEVER found a customer complaint of it scratching their wood floors. This is a TRIED and PROVEN technology! All of the SharkNinja vacuums I have reviewed that are equipped with DuoClean excel at cleaning hardwood flooring. Of course, you will experience similar performance on engineered flooring, KlickLock, tile, stone, cement, and Vinyl. You have two mode options for vacuuming hardwood floors: You can use the Shark ION P50 in the Upright Mode or the Portable Mode as seen in the picture. I find the Portable Mode to be the best option because it gives you easier maneuverability. Because of the broader Power Head its not quite as maneuverable as the Dyson’s with their Fluffy power brush. In my opinion, the most valid argument for purchasing a cordless vacuum is CONVENIENCE. With the Lift-Away feature and the convenience of cord-free operation the Shark ION P50 (IC162) is one of the most versatile cordless vacuums I have reviewed. When you launch into the Lift-Away mode (module contains the motor and dirt canister) you have the convenience of a 5.42 lb. portable vacuum that gives you the ability to reach up and clean along the ceiling and wall, clean ceiling fans, book shelves, and air vents. 5.42 lbs. is only about 2/3rd s the weight of a gallon of milk which is easily supported by your arm. Those dirty carpeted stairs are no challenge for the Shark ION P50 (IC162). You can use the DuoClean Power Head which works well but the extension wand is a little bit long. You can also use the Upholstery Tool which works OK but doesn’t provide the mechanical agitation of the Power Head. I would like to have seen SharkNinja include a Mini Power Brush which would improve its stair cleaning ability. With the assortment of tools you can clean your upholstery and furniture, or clean the car without having to unwind an extension cord. The main job of any vacuum cleaner is to remove dirt from your home. I’m sure that comes as a big surprise LOL! But in the process it can stir up a lot of dust with all kinds of allergy-triggering villains such as pollen, pet dander, etc. That stuff gets circulated through the machine and blown back into the room for you to breathe if it doesn’t have a sufficient filtering system. Most cordless stick and upright vacuums utilize sponge filters to trap the smaller dust particles. The reason for this is that HEPA filters tend to inhibit air flow causing a loss of suction and cleaning performance. Because the Shark ION P50 (IC162) has the extra power provided by a 28.8V battery a HEPA Filter is utilized to trap the finest dust particles. SharkNinja calls it their Anti-Allergen Complete Seal Technology that’s able to trap up to 99.99% of dust and allergens as tiny as 0.3 microns. This should be a huge consideration if someone in the household suffers with allergies or other respiratory issues. Free-Standing lets you park it anywhere without having to lean it against the wall or furniture. Removable/Replaceable Battery Pack Power lets you Upgrade the runtime and revitalize the vacuum when the original battery finally dies and won’t hold a charge. DuoClean Feature is the most effective concept for equipping a vacuum cleaner to clean both hardwood and carpeted flooring. HEPA-Level filtration should make it a NO-BRAINER for anyone who suffers with respiratory issues. No Mini Power Brush for cleaning stairs. With the Shark ION P50 the cleaning tools attach to the end of the Removable Extension Wand/Handle which is nice for some applications but doesn’t give you the advantage of using it as a Handheld vacuum like the Dyson V8 and V10 series. The Shark ION P50 (IC162) is one of the nicer cordless upright vacuums I have reviewed. It’s certainly a refreshing departure from the all-to-familiar motorhead design that’s become so popular – although not necessarily better. 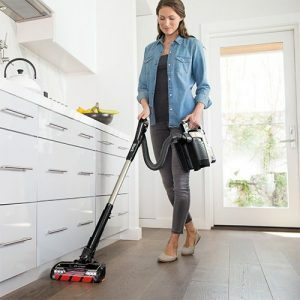 practical one I have reviewed – practical in the sense that it offers sufficient cleaning power and utility to earn its keep. To me the most obvious advantage the Shark ION P50 (IC162) has over other popular cordless upright stick vacuums is that it is FREE-STANDING! You really begin to appreciate this feature when you have to stop vacuuming to answer your phone or deal with other urgent matters. One of the questions I hear from customers shopping for a cordless upright vacuum is “can I use it as my primary vacuum?” The answer to that question is Yes, Maybe, and NO! The problem with buying a battery-operated vacuum to use as your only vacuum is LIMITED CAPACITY. By nature cordless vacuums have Limited Runtime Capacity, Limited Dirt-Holding Capacity, and Limited Power capacity. Whether or not you can live with those limitations depends on the size of your house, flooring, number of people in the household, and whether or not you have pets – especially large shedding pets. I do consider the Shark ION P50 (IC162) a very good Cordless Vacuum for Pet Hair, even without the Mini Power Brush. For most situations a good cordless upright or stick vacuum will be a valued addition to the home. It will serve well as a supplementary or secondary vacuum to do what I call maintenance cleaning. What I mean by that is they work well to help you keep your house clean after a full-size CORDED Upright has done the heavy lifting on carpet. When it comes to area rugs, low to medium pile carpet, wood and other hard floor surfaces the Shark ION P50 (IC162) is all the vacuum cleaner you will need! I like to tell my customers to “KEEP YOUR EXPECTATIONS REAL” and you won’t be disappointed. The Shark ION P50 Lightweight Cordless (IC162) presents a compelling option to consider. I’m impressed with it’s overall cleaning performance, versatility, and quality. Compared to the top competitors it represents a Trade-Off of conveniences and advantages. The overwhelming majority of Customer Reviews from for SharkNinja battery-operated vacuums are overwhelmingly POSITIVE. Why not give it a try find out why! Weight 12.03 lbs. (including battery) / Pod Weight: 5.42 lbs 5.8 lbs. 5.88 lbs. 8.7 lbs.